Mention what are the new features in MS Exchange 2013? Meet the latest demand: With improved search and indexing, you can search across Lynch 2013, Exchange 2013, SharePoint 2013, etc. Mention what is recommended when you are using an exchange account for your work, when you are offline? It is suggested that you use Cached Exchange Mode when you are using an exchange account for your work, as it eliminates all the reason to work offline. With Cache Exchange Mode, you can keep continuing working even if you are disconnected with the network. Cache Exchange Mode uses a folder file (.ost) and manages a synchronized copy of the items in all folder in the mailbox, when you are offline. As soon as you are connected to the network, it syncs your data automatically to the server without losing any data. Mention what are the roles in MS exchange 2013? In MS exchange 2013, there are two roles Client Access Server and Mailbox Server. Mention what is the role of Client Access Server? Mention what is the role of Mailbox server? Explain what are the important features of Transport Pipeline? 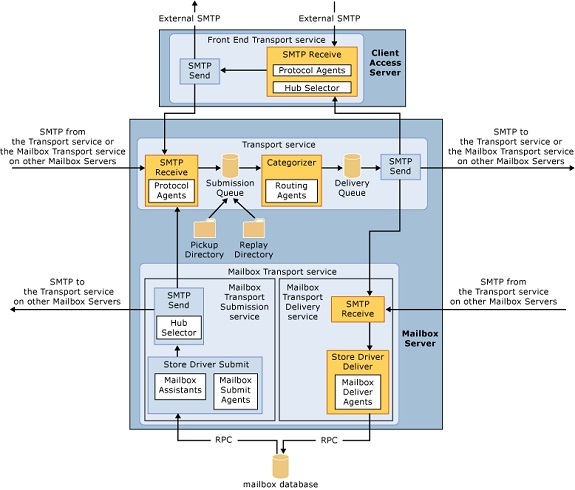 Mailbox Transport: This system includes receiving and sending SMTP to the transport service from mailbox using RPC (Remote Procedure Call). Explain what is the role of categorizer? Explain the term DAG (Data Availability Group)? DAG or Data Availability Group is a framework build is MS Exchange 2013. It is a group of upto 16 mailbox server that hosts a set of databases and provides automatic database level recovery due to failure of servers of databases. Mention how many types of delivery groups found in MS Exchange 2013? Explain how message is delivered to the mailbox database in Exchange 2013? In exchange 2013, after the message reaches the target mailbox server in the destination AD site, the transport service avails SMTP to carry the message to the mailbox. After that, using RPC, Transport Service delivers the message to the local mailbox. What action does Front End Transport service does? Mention what is the function of mailbox Transport Submission service? Mailbox Transport Submission service does one of the following actions based on the number and type of recipients. If there is no mailbox recipient, select a mailbox server in the local delivery group. How the flow of the mail is tracked in MS Exchange 2013? To track message flow in MS Exchange 2013, Delivery Reports are used. It is applicable for Outlook and Outlook web only. However, Message Tracking Logs are also helpful to know the flow of the mail. A hard disk that stores the message queue database on with at least 500 MB of free space. sets appropriate permissions on objects to allow them to be managed. Automatically configures user profile settings for clients running Microsoft Office Outlook 2007, Outlook 2010, or Outlook 2013, as well as supported mobile phones. Provides access to Exchange features for Outlook 2007, Outlook 2010, or Outlook 2013 clients that are connected to your Exchange messaging environment. Availability service—The Availability service is the replacement for Free/Busy functionality responsible for making a user’s calendar availability visible to other users making meeting requests. A mail exchange (MX) record that contains information about which mail server the domain uses to receive mail. *.edb File - A mailbox database is stored as an Exchange database (.edb) file. Database portability is a feature that enables a Microsoft Exchange Server 2013 mailbox database to be moved to or mounted on any other Mailbox server in the same organization running Exchange 2013 that has databases with the same database schema version. Mailbox databases from previous versions of Exchange can't be moved to a Mailbox server running Exchange 2013. By using database portability, reliability is improved by removing several error-prone,manual steps from the recovery processes. In addition, database portability reduces the overall recovery times for various failure scenarios. The below diagram provides more detail on the mail flow in Exchange server 2013.
and that the message hasn't been tampered with. minutes in any folder that's configured to synchronize. Otherwise, the server should return an HTTP 200 OK message. The mobile device then stands by. The 15-minute time span is known as a heartbeat interval. If no items change in 15 minutes, the server returns a response of HTTP 200 OK. The mobile device receives this response, resumes activity (known as waking up), and issues its request again. This restarts the process. If any items change or new items are received within the 15-minute heartbeat interval, the server sends a response that informs the mobile device that there's a new or changed item and provides the name of the folder in which the new or changed item resides. After the mobile device receives this response, it issues a synchronization request for the folder that has the new or changed item. When synchronization is complete, the mobile device issues a new PING request and the whole process starts over. Retention tags are used to apply retention settings to folders and individual items such as e-mail messages and voice mail. These settings specify how long a message remains in a mailbox and the action to be taken when the message reaches the specified retention age. When a message reaches its retention age, it's moved to the user’s In-Place Archive or deleted. Unlike managed folders (the MRM feature introduced in Exchange Server 2007), retention tags allow users to tag their own mailbox folders and individual items for retention. Users no longer have to file items in managed folders provisioned by an administrator based on message retention requirements. Microsoft Client Access server can act as a proxy for other Client Access servers within the organization. This is useful when multiple Client Access servers exist in different Active Directory sites in an organization, and at least one of those sites isn't exposed to the Internet. A Client Access server can also perform redirection for Microsoft Office Outlook Web App URLs and for Exchange ActiveSync devices. Redirection is useful when users connect to a Client Access server that isn't in their local Active Directory site, or if a mailbox has moved between Active Directory sites. It's also useful if users should actually be using a more effective URL. For example, users should be using a URL that's closer to the Active Directory site in which their mailbox resides. A witness server is a server outside a DAG that's used to achieve and maintain quorum when the DAG has an even number of members. DAGs with an odd number of members don't use a witness server. All DAGs with an even number of members must use a witness server. The witness server can be any computer running Windows Server. There is no requirement that the version of the Windows Server operating system of the witness server matches the operating system used by the DAG members. doesn't have a copy of the cluster quorum data. In this mode, a majority of the voters (the DAG members plus the witness server) must be operational and able to communicate with each other to maintain quorum. If a majority of the voters can't communicate with each other, the DAG's underlying cluster loses quorum, and the DAG will require administrator intervention to become operational again. DAGs with an odd number of members use the failover cluster's Node Majority quorum mode. In this mode, each member gets a vote, and each member's local system disk is used to store the cluster quorum data. If the configuration of the DAG changes, that change is reflected across the different disks. The change is only considered to have been committed and made persistent if that change is made to the disks on half the members (rounding down) plus one. For example, in a five-member DAG, the change must be made on two plus one members, or three members total. Standby Active Manager provides information of the server hosting the active copy of a mailbox database to the Client Access or Transport services. Transport dumpster helps to protect against data loss by maintaining a queue of successfully delivered messages that hadn't replicated to the passive mailbox database copies in the DAG. When a mailbox database or server failure required the promotion of an out-of-date copy of the mailbox database, the messages in the transport dumpster were automatically resubmitted to the new active copy of the mailbox database. The transport dumpster has been improved in Exchange 2013 and is now called Safety Net. Safety Net is a queue that's associated with the Transport service on a Mailbox server. This queue stores copies of messages that were successfully processed by the server. You can specify how long Safety Net stores copies of the successfully processed messages before they expire and are automatically deleted. The default is 2 days. Safety Net doesn't require DAGs. For Mailbox servers that don't belong to a DAGs, Safety Net stores copies of the delivered messages on other Mailbox servers in the local Active Directory site. Safety Net itself is now redundant, and is no longer a single point of failure. This introduces the concept of the Primary Safety Net and the Shadow Safety Net. If the Primary Safety Net is unavailable for more than 12 hours, resubmit requests become shadow resubmit requests, and messages are re-delivered from the Shadow Safety Net. Safety Net takes over some responsibility from shadow redundancy in DAG environments. Shadow redundancy doesn't need to keep another copy of the delivered message in a shadow queue while it waits for the delivered message to replicate to the passive copies of mailbox database on the other Mailbox servers in the DAG. The copy of the delivered message is already stored in Safety Net, so the message can be resubmitted from Safety Net if necessary. In Exchange 2013, transport high availability is more than just a best effort for message redundancy. Exchange 2013 attempts to guarantee message redundancy. Because of this, you can't specify a maximum size limit for Safety Net. You can only specify how long Safety Net stores messages before they're automatically deleted. The HighAvailability channel contains events related to startup and shutdown of the Microsoft Exchange Replication service and other components that run within it, such as Active Manager or VSS writer for example. The HighAvailability channel is also used by Active Manager to log events related to Active Manager role monitoring and database action events, such as a database mount operation and log truncation, and to record events related to the DAG's underlying cluster. The MailboxDatabaseFailureItems channel is used to log events associated with any failures that affect a replicated mailbox database. An accepted domain is any SMTP namespace for which a Microsoft Exchange Online organization sends or receives email. Accepted domains include those domains for which the Exchange organization is authoritative. An Exchange organization is authoritative when it handles mail delivery for recipients in the accepted domain. Accepted domains also include domains for which the Exchange organization receives mail and then relays it to an email server that's outside the organization for delivery to the recipient. What are the High Availability features introduce in Exchange Server 2010? What is Exchange Control Panel? ECP it’s a new and simplified web based management console and it’s a browser based management client for end user, administrators and specialist, ECP can be accessible via URL, browsers and outlook 2010, ECP deployed as part of the client access server role, Simplified user administration for management tasks and it’s RBAC aware. Who can use ECP and what are the manageable options? Specialist and administrators – administrator can delegate to specialist e.g. help desk operators – Change user name password etc., department administrator – change OU and e-discovery administrators – legal department. End users – comprehensive self-service tools for end users – fetch phone number, changing name and create groups. Hosted customers – tenant administrators and tenant end users. What are the options shared in federated sharing? What is Microsoft Federation Gateway? What are the archiving options introduced in Exchange Server 2010? What are the Retention Policies in Exchange Server 2010? What is journaling and what are the journaling features in Exchange Server 2010? Journal report de duplication – reduces duplication of journal reports. Exchange server 2010 creates one report per message. What are the different Exchange Recipient types? User mailbox: This mailbox is created for an individual user to store mails, calendar items, contacts, tasks, documents, and other business data. Linked mailbox: This mailbox is created for an individual user in a separate, trusted forest. For example AD account is created in A.COM and Mailbox is created in B.COM Exchange Server. Shared mailbox: This mailbox is not primarily associated with a single user and is generally configured to allow logon access for multiple users. Legacy mailbox: This mailbox is resides on a server running Exchange Server 2003 or Exchange 2000 Server. Room mailbox: This mailbox is created for a meeting location, such as a meeting or conference room, auditorium, or training room. When we create this mailbox, by default a disabled user object account is created. Equipment mailbox: A resource mailbox is created for a non-location specific resource, such as a portable computer projector, microphone, or a company car. When we create this mailbox, by default a disabled user object account is created. Equipment mailboxes provide a simple and efficient way for users to use resources in manageable way. What is a Smart Host? Where would you configure it? A smart host is a type of mail relay server which allows an SMTP server to route e-mail to an intermediate mail server rather than directly to the recipient’s server. Often this smart host requires authentication from the sender to verify that the sender has privileges to have mail forwarded through the smart host. This is an important distinction from an open relay that will forward mail from the sender without authentication. Common authentication techniques include SMTP-AUTH and POP. Used for backup mail (secondary MX) services. Used in spam control efforts. What are the new features introduced in Exchange Server 2010 on overview perspective? What’s New in Exchange Server 2010 in Client Access Server Level? Client Access Server level improvements in Exchange Server 2010 are Federation certificates, Exchange ActiveSync, SMS Sync, Integrated Rights Management, Microsoft Office Outlook Web App, and virtual directories. Federation certificates can be a self signed certificate instead of a certificate issued by a CA to establish federation trust. Client throttling policies will help you manage performance of your Client Access servers. Only the policies to limit the number of concurrent client connections were enabled by default. Exchange 2010 SP1 all client throttling policies are enabled by default. What are the new Transport Server level features in Exchange Server 2010? Top 13 Exchange interview questions - Career Guru99. Exchange interview question pdf - Technet Microsoft. Exchange 2010 Interview questions - documents.tips. Exchange 2010 Interview question and answers - nextstep4it. Top 10 features in Exchange 2010 - Techrepublic. What's new in Microsoft Exchange 2010 - Technet Microsoft.